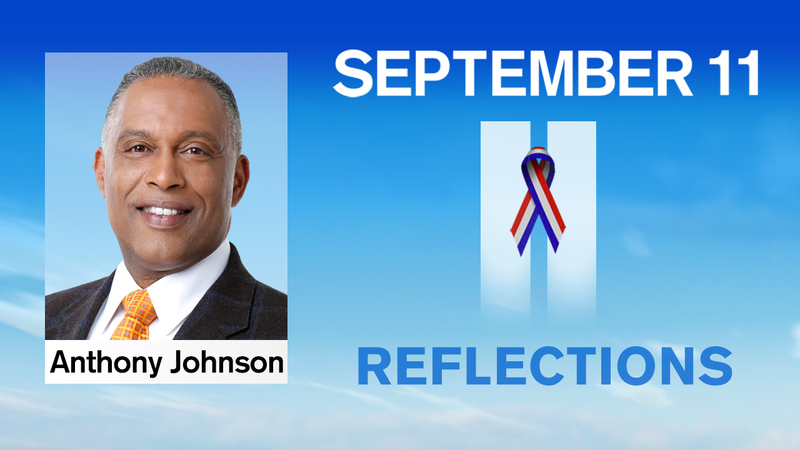 NEW YORK (WABC) -- As fate would have it, 9-11-01 was one of the most picture perfect days weather-wise. For me, it started out glorious because I was the 3 a.m. reporter assigned to cover the primary election and had scored a nice interview with Peter Vallone, who was City Council speaker and was making a bid to become mayor. Once the morning show and cut-in wrapped up, we went over to a small diner on 21st Street in Queens to eat and plan our next report at noon. As soon as we finished, the phone rang and a breathless producer said: Run to the World Trade Center, a plane crashed into the building. The team of Dean DiGenero, John McCurdy and I quickly took off heading into Manhattan. Along the way, we got a glimpse of the north tower of the World Trade Center and could see smoke pillowing out of the building. My first thought was that this was not a small plane. We were listening to 1010 WINS radio as we entered through the Queens Midtown Tunnel. Soon, the radio signal turned to static. As the signal began to clear, we heard the announcer say that a second plane had just crashed into the south tower of the Trade Center. Immediately, we knew this was no accident, but an act of terror. Once we got into Manhattan, we followed several emergency vehicles downtown. We weaved through traffic and made it down to the Federal Courthouse, where Dean and I got out with the camera and walked about six blocks to the World Trade Center. The first thing that struck me was the sea of people walking in the opposite direction. We were fighting a wave of bodies, many looking shocked and confused as they left lower Manhattan. We arrived on the corner of Fulton and Broadway and realized that there were a number of people covered with water standing on the street. They had escaped from the building, but got wet when the water sprinklers came on because of the fire. Many were in such a state of panic they didn't talk, and when they did, their minds seemed to wander away. After getting some stressed out people to talk, we decided to move closer to the towers. However, a Port Authority cop, who I would kiss if I saw him today, was adamantly telling us to go back under the threat of being arrested. After some harsh words, we backed off. I also realized about the same time that the breakfast coffee had gone through me, and mother nature was calling, so I had to find a bathroom. New York is a tough city to find a restroom, especially if you are not a customer. But on that day, at that time, the owner of a deli allowed me to use his restroom. As soon as I turned in the direction of the bathroom, I heard this terrible sound and the ground shook. First, I thought a train exploded. Dean and I ran outside and saw a 30-story high cloud of debris and smoke rolling toward us. The first tower had crumbled. We braced next to the door, watching the cloud come in our direction. We jumped back inside the deli and watched the cloud roll by and watched daylight turn to pitch-black night like the angel of death passing by. While trapped inside the deli, the dust began seeping in and people trapped in the cloud inched their way to the door, coming in covered in soot, coughing, choking and screaming. Everyone began ripping off their shirts, picking up towels, anything to cover their faces. It was about that time that I seriously considered the fact I may never go home again. Finally, the dust began to settle, and Dean and I went outside. The debris was still coming down, and it was hard to keep our eyes open. We began video taping and people began coming in our direction, covered in dust. It looked like nuclear winter. Some spoke to us, calling for help. As I looked around, I saw shoes, hats and bank paper scattered all over the ground and two inches of pulverized debris on the street. It was eerie - the quiet after disaster strikes. Moments later, we heard what sounded like a plane, and that set off a panic. Many believed that more planes controlled by terrorists were about to strike again and we were sitting ducks. Everyone ran into a building, but the security guard said no media was allowed. We told him in not so kind words, hell, we are running for our lives! We could not be stopped and proceeded with the crowd to run out another entrance facing City Hall. Once again, the roads were covered and injured people were walking up the road with cops, covered in soot, toward a makeshift triage center near City Hall. Blood was gushing out of cuts everywhere. Some needed oxygen, others had to be wiped down just to get fresh air. Once we got back to the live truck, we went on the air with several broadcasts. Before the first report, the second tower came down. A feeling of doom seemed to be in the air. A woman walking past the truck asked what was going on. I told her the World Trade Center is gone. She screamed, "My daughter works in there." I wonder to this day if she was the mother of one of the victims. Meanwhile, we watched as workers began putting together makeshift stretchers. They would use plywood and two-by-fours. This went on for hours and hundreds of stretchers were placed on trucks to be used in bringing out victims from the disaster. Hours later, those trucks returned full of stretchers because there were no victims to recover. These are some of most vivid memories of that day, and I thank God for the cop who didn't allow us to get near the tower. If we could have, we would have gone inside. I'm also thankful that I had to use the restroom. I still wonder if the shoes and clothing I saw on the street belong to any of those thousands who died on that terrible day.